The European Outdoor Film Tour is a travelling film fest showcasing frankly the most awe inspiring, heart -warming, adrenaline charging, tear jerking outdoor adventure movies on the planet! From extreme Kayaking to Big face climbing via Mountain Biking, steep skiing and wing-suiting you are granted the keys to audio visual nirvana for any outdoor enthusiast. Having made it to 2 previous EOFT’s but missing the last one I spotted a poster for this years so grabbed 2 tickets for the Glasgow showing last night at the great venue of the Old Fruit Market in Glasgow’s Merchant City. Joining the around three hundred other like-minded souls Sam and I took our seats and settled down in a sell out house to enjoy what was to come. 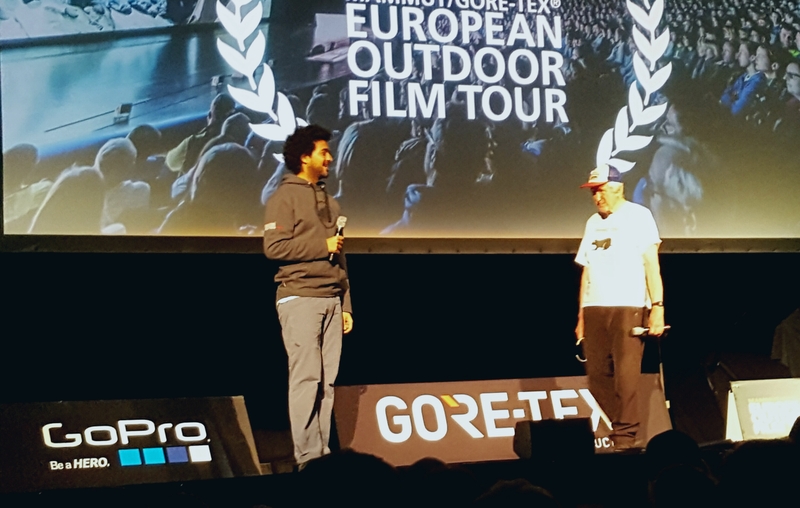 EOFT’s key sponsors are Mammut (I really want that giant inflatable Mammoth! ), Gore-TEX and Ellis Brigham but a raft of names support this brilliant festival of all things adventure. Rather than wax on about it, and try to convince you that its an event not to be missed , let me take you through what was on offer and you can make your own mind up! Please note all pictures that follow are copyright of the filmakers but I thought it best to show you how glorious the scenes can be. Then onto a story of a German mountain biker who finds peace and slowing of time only when going fast, very fast on some of the most extreme and exposed terrain you can imagine. In search of the Flow as Harald Philip explains it is what drives him to push the comfort zone enough to expand it, but not to burst it. Directed by Christian Schmidt and Joachim Hellinger this short films follows Harald as he finds downhill lines across varying extreme landscapes including routes normally reserved for via ferrata hikers on the edge of some serious big drops and super fast downhills along routes that he will take time to go and clear even if he rides them only once year. Heart in mouth moments balanced with intriguing personal insight into what drives us to take risks. After that we head to a more introspective look at BASE jumping life and brotherlike friendship lost in the carefully directed and very personally narrated When we were Knights. Directed by Anson Fogel and taking the form of a spoken letter that was never opened we hear from Matt Blank himself about the friend and constant companion in climbing and wingsuit he has lost. Ian Flanders died doing what they both loved but does that make it any less tragic? Matt talk from the heart in equal measures of open love for his best friend and of the hole in life his loss has created. Beautifully filmed and perfectly delivered. A story you simply can’t turn away from. Then its lights up and the intermission. As is usual at the EOFT it’s a mad dash for the loo and a beer but also to check out what’s on offer to buy , see who’s around and to stick your ticket in the eagerly anticipated raffle for some shiny new gear. To kick off half 2 it’s a film called La Liste which see’s the “extra terrestrial” steep ski level skills of Swiss youngster Jeremie Heitz aim to take on a list of 15 , north face big alpine faces. At typically 55° and at altitudes and situations that most of us budding alpinists would see as bucket list stuff these are no normal lines. Stunning white peaks, jaw dropping skiing at up to 120km/hr and great filming mean edge of the seat stuff and more than a few “jesus!” moments. And to think I get nervous on the indoor slope if it’s too icy! David Llama is an incredible climber and has been since childhood. Hi skills are obvious – but does his heritage have a part to play? In Lunag Ri he returns to his father’s homeland of Nepal to revisit roots he’s not sure her truly has and with the legendary Conrad Anker to tackle a beast of a peak – Lunag Ri. Balancing his exploration of what Nepal means to him and the technical challenges of the climb this film by directors Joachim Hellinger and Peter Strauber shows Nepal in all its Himalayan glory and sees Llama and Anker tackle the incredible face that needs them to run the full gauntlet of rock, mixed, ice and big wall climbing. The film at times was a bit uncomfortable to watch as Llama seems to reject his roots as where his skills come from instead feeling its earned, not seeing the culture the way perhaps his father does and at times seeming lost for words on how to describe his feelings – but that’s what makes it so honest. Anker 27 years his senior is no lame duck instead showing yet again why he is one of the most legendary Alpinists alive today – and sees him mentoring the younger Llama from a position of experience – at one point being very open that he takes less risks now , “unlike these young guys “. You’ll need to watch it to find out! Pen-ultimately we move to something a bit different from the typical expedition or big mountain climbing saga. This time it’s about the real human frailties and realities that we don’t often get to glimpse among the high altitude celebration of alpine achievement. An epic expedition across Myanmar via Planes, Trains, motorbikes, extensive and exhausting jungle trekking and then mountaineering Down to Nothing follows a group led by Hilaree O’Neill as they attempt to first of all reach and then climb and summit Hkakabo Razi in former Burma. Along with Emily Harrington, filmmaker Renan Ozturk, Cory Richards and Mark Jenkins we see them deal with gear movement, lack of logistic resources, dwindling resources and fracturous pressures that lead to very testing times high in the Himalya. An exploration of what lengths we will go to , well beyond what is “do able” and what happens when we finally hit the wall this film is a glorious journey through amazing landscapes of Myanmar, personal demons and some amazing mountaineering. When you are down to nothing, what do you do? Before we know it we are at the last movie of the night but what a way to finish! If you don’t know who the reverend Bod Shepton is you’re missing out! This octogenarian explorer and climber is the man you need to know if you fancy some new routes in the very far north of Baffin Island. And who would want to go and find these climbs? A crazy foursome of climbers (Sean Villanueva O’Driscoll , Ben Ditto and the slightly bonkers brothers Olivier and Nicolas Favresse ) who spend as much time jamming , drinking and larking about as they do putting up some astounding routes! As the group set off across the frozen seas for Baffin on the 30 foot sloop the Dodo Delight Bob is treated to high jinks and late nights before dropping the team off to climb . New routes up some big faces and sea shanties make for a hilarious climbing film like no other and show that Bob is unlike any 80 odd year old Reverend I’ve ever seen! To top it off after the film he joined the MC on stage in his trademark “feed the rat” t-shirt , baseball cap and shades to tell us more tales before treating us all to a rendition of the films theme song “ Dodo’s Deleight”.. still stuck in my head!! Think you fancy the EOFT? Yeah. Thought so. Oh, and that raffle? 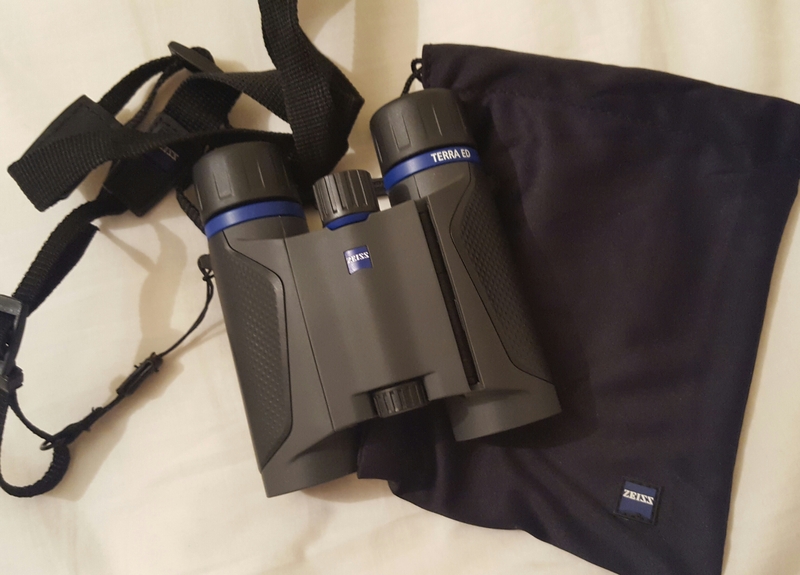 I only bloody won didn’t I and am now gthe proud owner of a pair of very lovely Zeiss Terra ED 8×25 Binoculars! 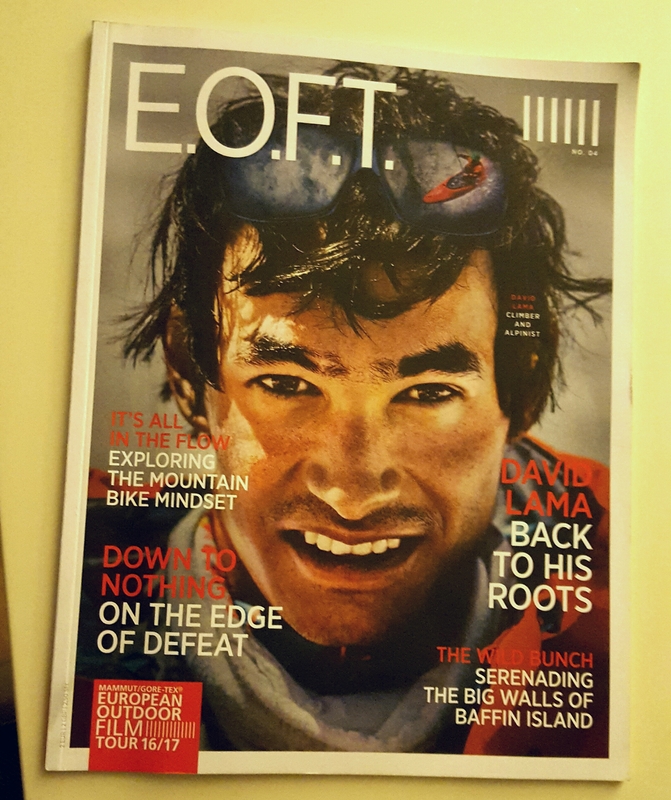 Thanks EOFT!! Previous post Tin. Stronger than you might think.